On August 2, 2017, President Trump endorsed the RAISE Act, which he claimed and the bill's co-sponsors claimed would simultaneously lower the number of immigrant admissions and attract immigrants with more “skills.” The RAISE Act would admit fewer refugees, end the diversity lottery program, and drastically cut the family-based system. While U.S. Immigration Law has been structured to set parameters around who may and may not enter (exclusion/inadmissibility) and who is allowed to remain (deportation/removal), it has recognized family integrity as a key component of a just immigration system. This Act strikes at the very heart of this central tenant of our nation’s immigration law. The Act will certainly face fierce opposition with some objecting that it’s racially motivated and others asserting that a reduction in immigration would have a negative economic impact, but one aspect that will likely not get much attention is its utter devaluation of family. The often-unchallenged narrative is that family reunification merely benefits immigrants, but is a drain on the economy of the United States, in a way that highly-skilled workers are not. This narrative is both inaccurate and harmful. Fifty-two years ago, on October 3, 1965, President Lyndon B. Johnson signed the Immigration and Nationality Act, abolishing the long-standing, national-origin quota system and laying the foundation of our present immigration laws – family integrity. 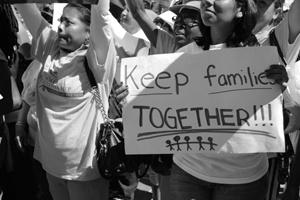 Yet, family unity as the cornerstone of our immigration system has been diminishing since long before the RAISE Act, especially for certain families, namely from Latin America and from oversubscribed countries outside of Latin America. In recent years, long wait times – sometimes twenty or more years – have meant that many families face lengthy separations. Ever-increasing immigration penalties and enforcement have left families torn apart, in ways they could not have been previously. And though the 1965 legislation opened the door for a more inclusive immigration policy, a cap placed on migration from the Western Hemisphere, which had not been subject to the quota system, and the abolishment of the Bracero Program (a program which brought guest workers from Mexico) in 1964 restricted legal avenues to immigrate for those closest to our border. For so many, there was, and continues to be, no “line” to wait in. To accentuate only family unity, however, ignores the benefits that the U.S. labor market derives from family-based immigration. Those coming through the family-based system meet labor needs in a more flexible way than employment-based immigrants. And women in particular are responsible for many of these contributions. The majority of women immigrating to the United States come through the family-based system and not the employment-based system, filling important needs in our workforce. Though the RAISE Act completely devalues their economic contributions, immigrant women frequently perform some of the most in-demand jobs – care work. Experts predict increasing shortages of caregivers who can meet the needs of the growing aging population in the United States. Much of this labor is provided by immigrants. The US economy has labor needs that immigrants, including family-based immigrants, meet, which benefits our society, even if the RAISE Act’s sponsors are unaware of it or, more likely, all too keenly aware of it. The RAISE Act is reminiscent of earlier restrictionist views that saw immigrants as an economic and cultural threat. President Trump noted that dismantling the family-based system would end “chain migration.” Like a century ago, underlying this desire is racial animus, disguised using neutral terms like “merit-based” and “highly-skilled” workers. It has little to do with attracting more skilled labor because the legislation does not seek to increase the number of skilled immigrants already admitted each year under the current employment-based system. President Trump's claim that the RAISE Act will “ensure that newcomers to our wonderful country will be assimilated,” outright ignores that assimilation requires a society that supports and values immigrants. Moreover, a family-based immigration system recognizes that living with family facilitates integration, not living in fear that your family may be torn apart. 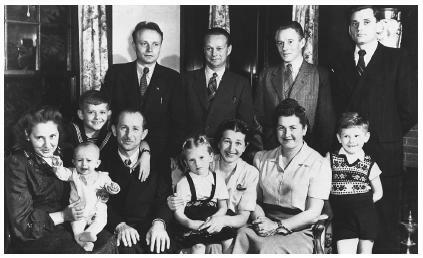 In 1965, Anthony J. Celebreeze, the Secretary of the Department of Health, Education and Welfare, said, “[t]here could be no more visible demonstration of our commitment to the ideals of individual worth, or of our recognition of the importance of the human values of the family, than a just and equitable immigration policy.”v The RAISE Act is the antithesis of a just and equitable immigration policy. We should not forget the origins of our family-based system, nor the values it sought to uphold. To read further about family reunification under Immigration Law, see Left Behind: The Dying Principle of Family Reunification Under Immigration Law. Anita Ortiz Maddali is the Director of Clinics and Associate Professor of Law at the Northern Illinois University College of Law. She writes about and teaches immigration law. Prior to coming to NIU, she represented women and children seeking asylum in the United States. She is a graduate of Northwestern University School of Law. i Ian Haney Lopez, White by Law: The Legal Construction of Race (1996). iii Testimony of Robert Kennedy, House of Representatives Subcommittee Hearings, at 411 (June 30, 1964). iv Tom Gjelten, A Nation of Nations: A Great American Immigration Story 91 (2015). v Statement of Hon. Anthony J. Celebreeze, House of Representatives Subcommittee Hearings at 334 (March 11, 1964).